For a year, every few weeks I met with poet Kathryn T.S. Bass to exchange paintings and poems, reflect upon our experiences as artists and women, and share tea. 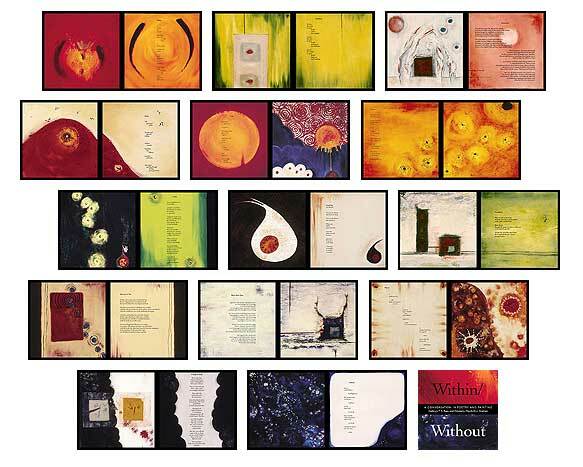 I painted panels that responded to her poetry, and she wrote poems that responded to my paintings. Within/Without is the intertwined result of our conversation, which centered on issues of creativity, fertility, and feminism. Over the course of the project, we grew as artists and as friends. SIZE, MEDIA, & FRAMING: Each piece comprises two 9" square panels, mounted in a shadow box so they appear to be floating, with a slight vertical offset and horizontal overlap (panels are shown below side by side for ease of viewing). Final framed size is 13.5 " H x 21.25" W. Frames are hand-crafted by furniture maker Greg Layer, of padauk wood with ebony keys. THE ORIGINAL SHOW: Within/Without was shown at The Western Colorado Center for the Arts during March and April of 2005.